How do you take your Toilet Paper? Over or Under? You know, in the holder. We have a reason for asking. It’s an interesting age-old question, isn’t it? We all remember the time when we encountered our first roll in need of changing….did you go to your mother for answers? In business, we can go to Tom Peter’s In Search of Excellence, where the idea that every touch-point matters is unpacked. At Office Divvy, we have about sixty SOPs (Standard Operating Procedure) to our collective credit, from toilet paper to the 14-point checklist for sanitizing a conference room. We can’t say for sure how Tom rolls but we think he would be proud. We even use it as an employee interview question when we are looking to see if someone’s a good fit for us. If a candidate says Under, that’s not necessarily disqualifying, but we want to raise their awareness and give them a view into our company culture–even as early as the interview stage. With all that being said, somehow, from time to time, there’re aberrations and we find that the toilet paper in one of our bathroom is hung Under. Is it a guest doing it? Is it is a ghost? But we pay great attention to our facilities. For instance each time a team member uses the bathroom, they are responsible for making sure everything is stocked, wiped, clean and neat. So really…how does that happen? We’ll probably never know. This made us curious about the general population’s policy when it comes to Over or Under. Well, we asked Palm Coasters at least. We posed the question on the I Love Palm Coast Facebook page, eager to see what nuggets of wisdom the people of Palm Coast might offer up. What we found was slightly surprising. If this was a national presidential campaign, it would’ve been a crushing landslide victory in both the Electoral College and popular vote. We can’t speak for the rest of the nation, but Palm Coast is united on the toilet tissue issue. Not only that, the Overs, in a large part, were the ALL CAPS kind of folks, whereas the Unders made their minority opines in their quiet Facebook voices. But with those kinds of numbers, confidence like that is no surprise. By the way, Snopes has a whole thing about whether or not that patent info is correct. 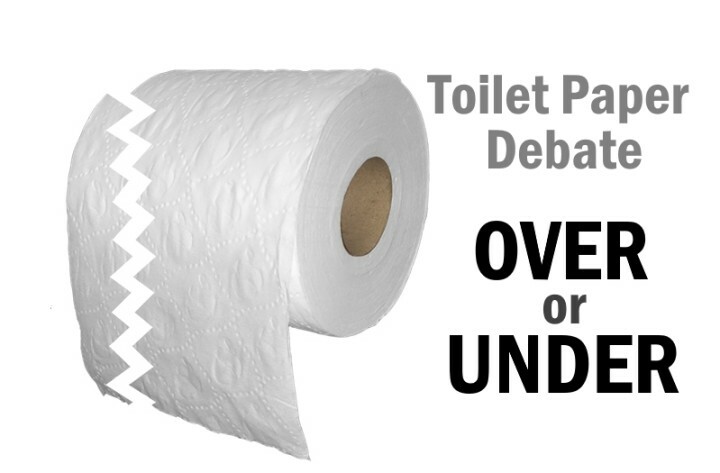 Read it here: The Great Toilet Paper Orientation Debate. So it appears that our office protocol when it comes to Over or Under aligns with the winning side of the argument. But, as you see, there’s protocol and then there’s reality, which, try as you may, can’t be controlled. And in this case, reality is driven by preference. So during those times when we enter “the lavatory” only to find that the roll has been set Under style, clearly–while Under is the minority opinion–those who believe in it, believe in it strongly. And belief is a powerful thing!